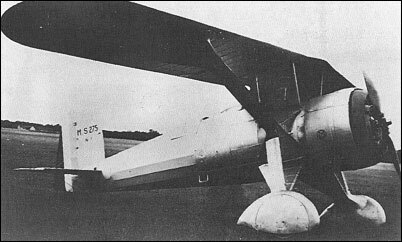 The C1 (monoplace de chasse) requirement first issued by the Service Technique Aeronautique in 1930 - when it was finally conceded that the Jockey programme had failed - and upgraded on 26 January 1931, resulted in no fewer than 10 designs being awarded prototype contracts. These included two Morane-Saulnier proposals. The first, the M.S.275, retained the classic parasol monoplane configuration of preceding Morane-Saulnier fighters and was flown in 1934. Powered by a Gnome-Rhone 9Krse nine-cylinder radial rated at 600hp at 4000m and armed with two synchronised 7.7mm guns, the M.S.275 proved exceptionally manoeuvrable and offered a very respectable performance. It found little favour, however, owing to its dated concept, development being discontinued, together with that of the more innovative M.S.325, in favour of the more promising M.S.405 then in preliminary design.